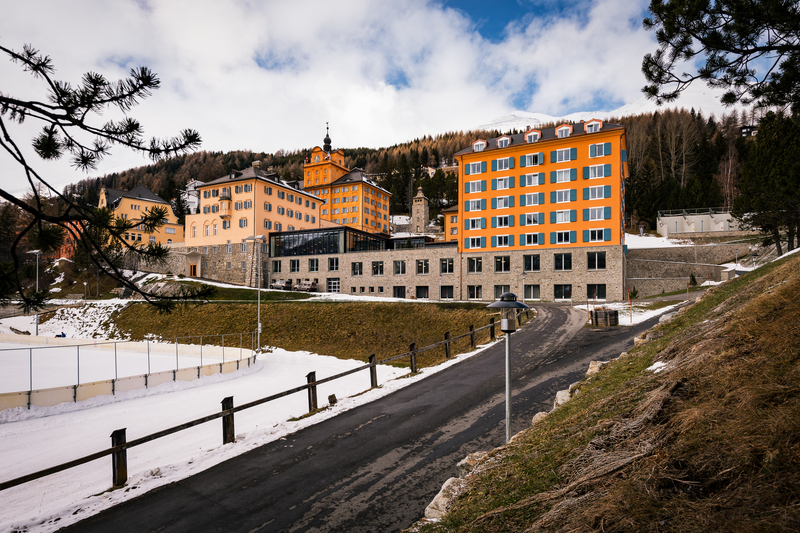 Top quality in education, promotion of eco-consciousness, healthy interaction, a well-kept appearance and physical well-being — all of these describe the Lyceum Alpinum private boarding school in Zuoz (Engadin, Graubünden). The construction of ‘Chesa Urezza’, a new building to meet academic and boarding needs, was carried out to increase the capacity of the school’s campus. 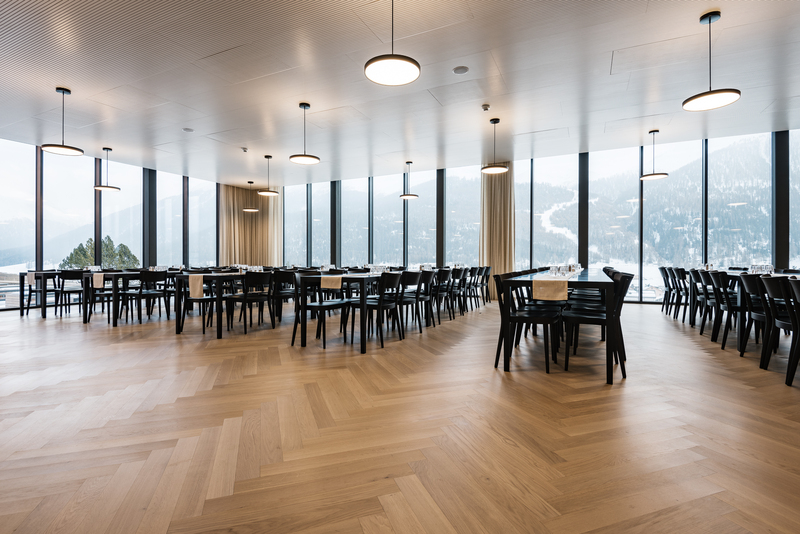 In its interiors, the parquet by Bauwerk was selected for its healthy style, ensuring top quality of interior spaces and a pleasant ambiance. The new impressive five-storey building, Chesa Urezza, includes 50 practical and high-quality boarding rooms, as well as various recreation spaces and classrooms for Arts and Music. The architect, Reto Maurizio, deliberately adopted the traditional architectural elements of the older buildings in Chesa Urezza, reinterpreting their style. 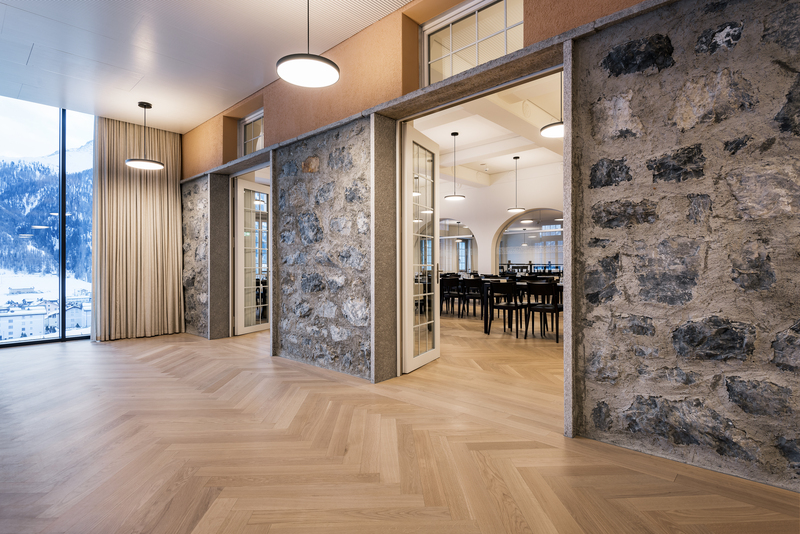 The campus expansion also included the addition of a terrace to the dining hall, built on a natural-stone base between the headmaster’s office building and Chesa Urezza. 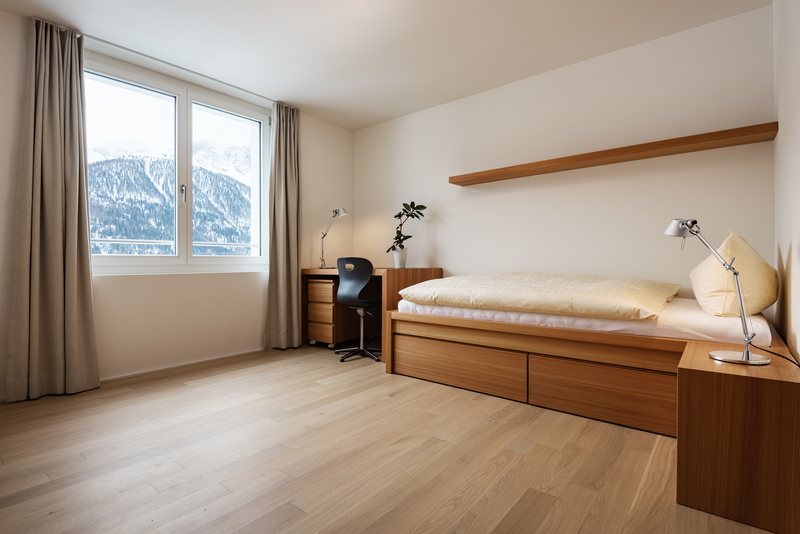 The rooms of the new building impress with the high value and quality of the materials used and with the impressive view off the imposing mountains and the river Inn meandering through the valley. Quality, ecology and aesthetics are the pillars of philosophy for the private school’s 300 students from more than 30 nations. This is also reflected in the requirements set for the interiors of Chesa Urezza: high-quality local and ecological materials that guarantee healthy and simple, but also stylish living. Thus, for example, the interior doors and cabinets are made of local larch. Practical and suitable for school life, the Cleverpark Oak Crema parquet with the innovative B-Protect® surface treatment was laid in the classrooms and boarding rooms. It combines perfectly with the red larch and other materials used. Visually, the high-quality elaboration of the parquet floor is difficult to distinguish from untreated natural wood. It offers all the protective qualities of a seal treatment, whilst also being completely invisible and 100% safe for use in living areas. 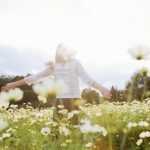 This significantly improves quality of life and well-being in the rooms of Chesa Urezza. Loud and unwelcome walking noises were an important issue in the bustling rooms of the private boarding school. The silent-padding proved to be helpful with this. This parquet base significantly dampens not only footfalls, but also noises from within rooms in general. This is a particularly hot topic in music rooms. If you can effectively reduce the echo, then you can fully develop your sound. Additionally, the room is acoustically insulated, and the neighbouring rooms do not have to be affected by the noise. With Cleverpark Silente, it is not at all necessary to walk carefully or be very quiet in the boarding rooms. 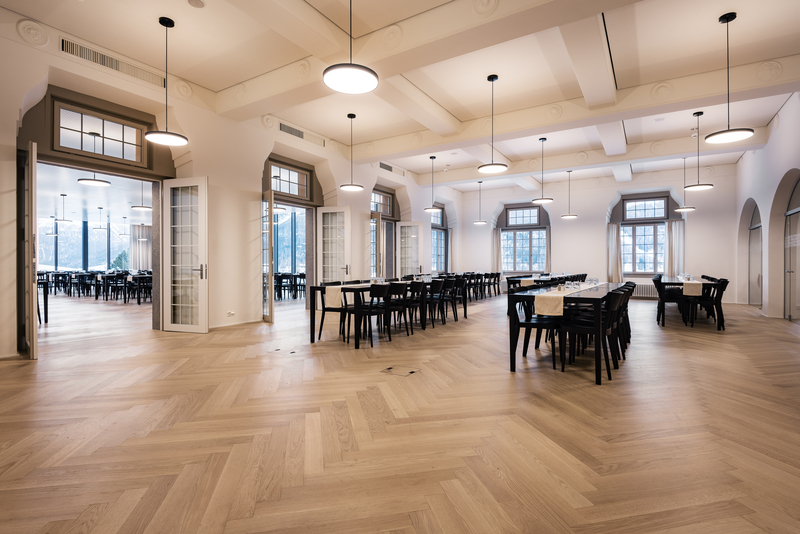 In the dining hall, the parquet base noticeably dampens noise from voices, and from tableware and chairs. 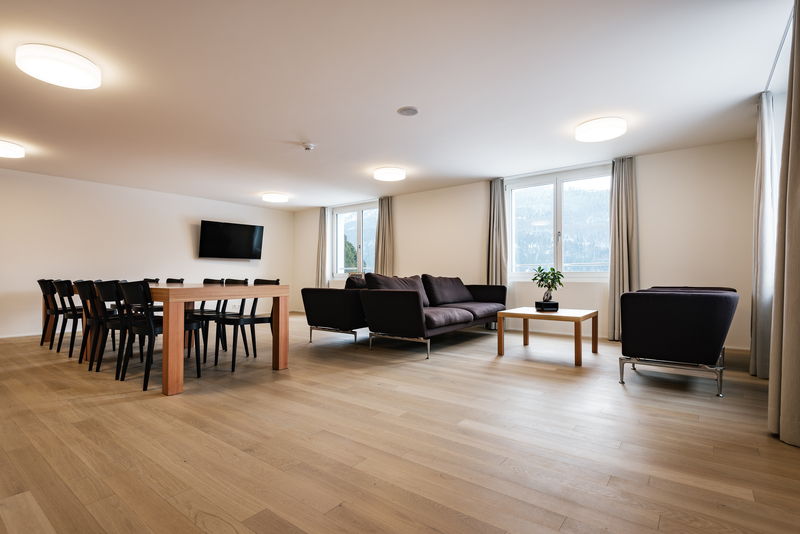 Cleverpark Silente has been awarded the «Cradle to Cradle Gold» certificate, thus fulfilling the ecological requirements of Lyceum Alpinum: this parquet is of controlled origin (Europe) and is part of a continuous material cycle, meaning that it can be reused without hesitation after any dismantling. Another quality-related advantage is that all Cleverpark products are made at the main site of Bauwerk in St. Margrethen. This complies with another concept that is important for Lyceum Alpinum in Zuoz: using the regional economic and value creation cycles. Top-quality furnishings: with its footfall reduction feature, the Cleverpark Silente parquet provides discretion and freedom of movement in all the 50 boarding rooms, the recreation rooms and the classrooms. The shade of the parquet floor is Oak Crema, which is in unison with the interior doors, cabinets and other larch furniture. 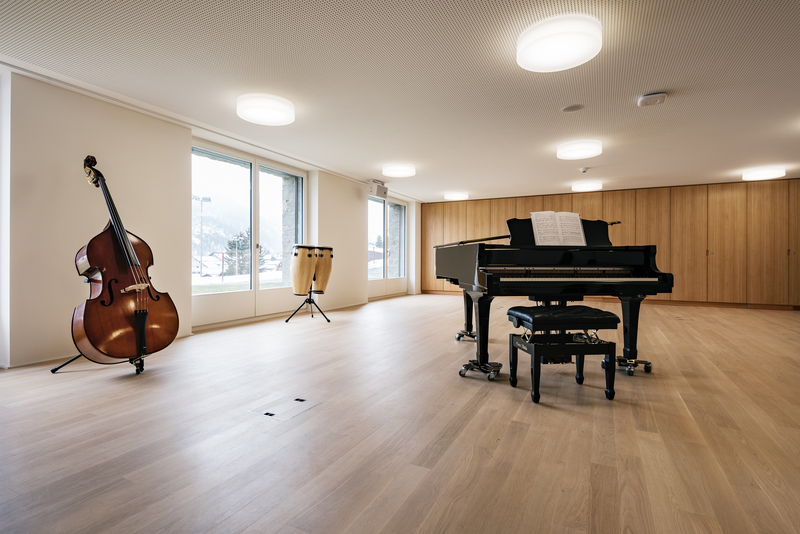 The Cleverpark Silente parquet was also laid in the music rooms, strengthening musical harmony. In the dining room, the classic herringbone laying pattern was used for the parquet floors. This laying pattern is particularly suitable for spacious, brightly lit rooms. It creates a fascinating play of light on the floor. 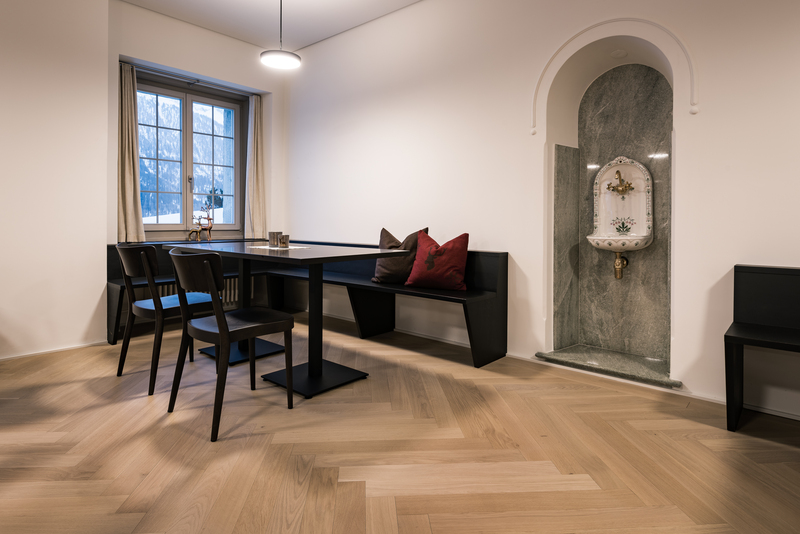 In the interiors, there was particular emphasis on local materials and Swiss products: apart from parquet floors by Bauwerk Parkett, horgenglarus chairs and Ribag lamps can also be found there.